Tiger Steel Homes provide an affordable, durable, and efficient alternative to wood-frame housing. Our houses are constructed on-site from your custom design using modern tube-steel framing, steel studs, and 26 gauge durable steel sheeting. Compared to other housing systems in their price range, Tiger Steel Homes provide a longer lasting, low-maintenance home with none of the drawbacks of traditional wood-frame housing such as mold, termites, wood rot and storm damage. Tiger Steel Homes can be finished in a variety of traditional materials such as vinyl siding, fiber cement siding, and brick as well as contemporary materials such as steel coated in energy star rated finishes. Our system allows the buyer to design the layout of their home in any way that they wish. No interior load bearing walls means that you can choose to place walls anywhere within the footprint of your building. Below are two examples of previous Tiger Steel Home builds. Both layouts are examples of three bedroom, two bath designs using a 1,000 square foot Tiger Steel Home. Tiger Steel also offers finished interiors. 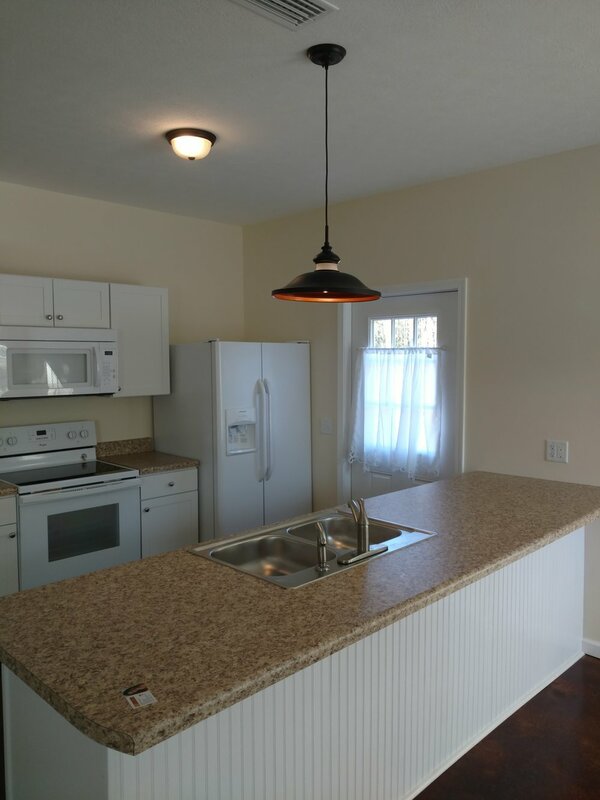 Everything from plumbing and drywall to countertops and paint, Tiger Steel can install it all. Our standard interior treatment includes stained and poly-sealed concrete floors, textured ceilings, painted drywall, and countertops. Our system allows for any kind of interior treatment that our clients might want in their home.